My mum is from Finland and I am Finnish by nationality, but I was born and have always lived abroad. I was born in Zimbabwe and we lived there until I was six years old. From then we have lived in Mauritius which is my dad’s home country. 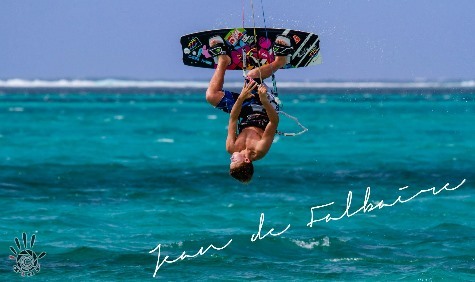 Mauritius is a small island in the Indian Ocean , east of Africa and the best possible place to kitesurf!! I started kitesurfing when I was ten years old and I entered my first competition, the Pointe d’Esny Crossing when I was twelve. Since then I’ve been participating at several competitions around Mauritius. Today I kite as much as I can, and train hard specially in freestyle. I’m really lucky to be able to kite in Mauritius, the water is warm, the lagoons are turquoise, we often have wind and there isn’t a lot of people who kite so I’ve got a whole lagoon for myself. When I first kited in Finland this July, it was so different! The water was much colder and I couldn’t see the bottom of the sea…but it was fun because the wind was strong and there was a good level on the water! By the way, another first; it was my first time kiting in a wetsuit.